I don’t think Natasha Bedingfield meant her song “Pocketful of Sunshine” to be a song of praise to God, but I’m going to take it that way anyway. The song begins by saying “I’ve got a pocket, a pocketful of sunshine”, and the overall message of the song is that one can escape her sorrows and stress by going to a hidden place. Well, I’ve got a pocketful of sunshine in my soul as well because I have a relationship with God. That hiding place she talks about? Well several Psalms talk about God being our hiding place. She says “I’ve got a love and I know that it’s all mine”. Oh yes! I do have a love from God and I know that nothing can take that love away from me. It’s a love that I still haven’t fully comprehended, but just to give you glimpse, it involved a completely innocent man dying because God knew I wouldn’t be able to have a relationship with him otherwise. This love surpasses anything I can do wrong or right, and it is completely free to me. It causes me to sing, dance, and smile. It urges me to love others just a bit more because I am so so thankful for the love God has given me. Bedingfield’s claim is that “you’re never gonna break me, sticks and stones are never gonna shake me”. As a Christian, I know that to be true because God has armed with a full armor of truth, righteousness, peace, faith, salvation, and the sword of the spirit (Ephesians 6). With that kind of armor, mere sticks and stones don’t stand a chance. With God, I am stronger than any army. To her enemies, she proclaims “wish that you could but you ain’t gonna own me, do anything you can to control me”. That’s what I yell at the Devil. When the devil tempts me and tries to control my mind or actions, I can rebuke him with scripture just like Jesus did in the garden. Because of God’s reign in my life, the Devil has no place in my life. God is bigger than the Devil. The bridge to the song says “There’s a place that I go that nobody knows, Where the rivers flow and I call it home, and there’s no more lies and the darkness is light and nobody cries; There’s only butterflies”. My place that I go? Into the arms of God. I can hide in his words and his comfort. In that place there are rivers of life (John 7:38), no lies (Numbers 23:19), and the darkness is made into light (John 8:12). There may not be butterflies, but the fact that Jesus is there is greater than anything. The presence of God is truly somewhere I can call home. As I walked home this afternoon listening to this song, the line “the sun is on my side, I smile up to the sky, I know I’ll be alright” caught my ear (and led to this post). I’ll take a little liberty here and replace the word “sun” with “Son” referring to Jesus. That Son is on my side, so on rough days or good days I can look up toward heaven and know it will be alright because God has a great plan that ultimately ends in my eternity with him in heaven. Praise God! So if you see me walking with my earbuds in bobbing along with a smile on my face, I just might be thinking about how I have a pocketful of sunshine. For me, this will be a song of worship. In the past month, I’ve been in four different churches because of various circumstances such as flooding and travelling. All of them are teaching the Bible, and there are people in each one who are genuinely seeking God. None of them, though, leave me feeling completely content with how I imagine the perfect church to be. The music is too slow or too loud; the lights are too bright or the building too cold; the people are too old or the crowd is too large; the drive is too far or I don’t want to go alone. These are just a few of the complaints that run through my head as I leave a service. I know being plugged in to one church is what I desire, but the grass looks greener on the other side. Lately it seems as if there’s always something better somewhere else. That’s not normal for me, so I started praying. After some heart-searching, these are the answers that God gave to me. Maybe these thoughts will help someone else in a similar circumstance. What I need to remember is two-fold. First church is not about all of the frills, which I’m honest is where most of my complaints lie. The most important part of church is God. God can speak with old hymns, new rock, bright lights, a yelling preacher, a long sermon, or a quick devotion. God is not bound by any circumstances. The only thing that binds me from hearing his words is myself. Secondly, all of these churches are run by people. Granted, I think all of the churches I’ve been at lately are led by people seeking God. Still though, I find myself wanting certain circumstances to worship. Rather than looking for perfection in the man-made aspects of church, I should look for perfection in the God-driven aspects of church. My focus should be on praising God and leaning toward him rather than examining the layout of service. Lastly, even with all of the imperfections I can find in churches, I still find church to be very important to my faith in God. Yes, all of the answers I need for my relationship with God are found in the Bible and through time with Him, but God made us for fellowship. When Jesus left the Earth, he left a group of believers and told them to stick together. God didn’t design me to navigate this world alone. He intends for me, and others, to meet together regularly to worship Him and study his Word. While I can, and should, worship and study all week long, there’s just something special about gathering with other believers no matter which building I do it in. I have no answers about what the perfect church service or atmosphere looks like, probably because it doesn’t exist, but I do know that no matter where I end up on Sunday, my one focus should be to worship God and learn more about Him. Forrest Gump said “life is like a box of chocolates; you never know what you’re going to get”. That’s true to some extent in that we can’t predict our own life. Most of the time we also don’t know what’s going to happen in life either. Life is often like eating bites of chocolate: sometimes we get the really good pieces with the whipped chocolate truffle, but other times we get the nutty chocolate or the piece with the half dried cherry. Sometimes though, we get a box of chocolates that has the label on the inside of the box. To me, in the metaphor of life, that’s the guidebook God has given us, aka The Bible. If we read the Bible and have conversation with God, our next steps will be clear. What happens though is that we get so excited about the chocolate that God has to offer that we forget to consult the guidebook for our next steps. Then we end up eating that rotten piece of chocolate with all of the nuts. Other times maybe our chocolate pieces are out of order, and we end up with a piece that isn’t what we expected. That doesn’t mean the guidebook misled us; it simply means that we have to trust God even more for grace to deal with unknown situations. My encouragement to you and to myself is to take time daily to spend time reading the guidebook for life and talking to the author of the guidebook. I am Mary, and many years back my life changed dramatically. You’ve probably heard my name and seen my picture in the manger scenes, but I want to take a moment to share something that even I still don’t understand. The angel had an answer for that: the Holy Spirit would provide that. He also informed me that my cousin Elizabeth would have a baby soon as well. The only was I could think to respond was to submit to the plan God was enacting. Later, I visited my cousin Elizabeth and sure enough, she was pregnant. All I could think was “my soul magnifies the Lord, and my Spirit rejoices in God my Savior” (Luke 1:46-47). God was doing something magnificent, and I just felt humbled to be part of it. My baby’s birth was even dramatic and God-led. We had to go to Bethlehem for the census. Traveling that distance while pregnant wasn’t easy, but Joseph was so good to me. There also wasn’t room in any inns, but we found a warm barn. That night I gave birth to my son, God’s son, Jesus. At first I thought our lives would be quiet after such a humble birth place, but it wasn’t long before we had visitors. Shepherds visited and they sang. Supposedly they’d been visited by an angel as well. Later my son would be called a lamb as well as a shepherd, so I guess it’s fitting that shepherds were his first visitors. 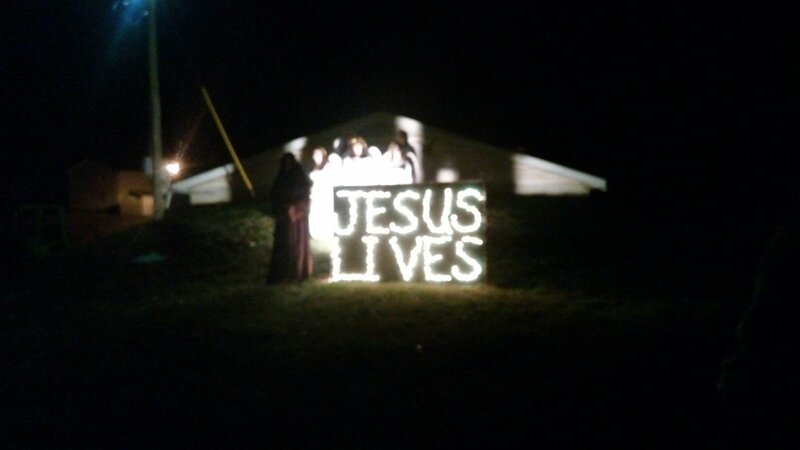 Later we had some wisemen visit. They had followed a star all the way to our house. God was spreading the word far and wide. These wisemen worshipped Jesus as they would a king because they recognized his power even while he was a child. If only others would worship him like these first visitors. I still can’t fathom why God chose me, but I’m glad he did. As you ponder my story with me, remember how eloquently God orchestrated his son’s arrival on Earth and for the purpose of allowing us all to know God more closely. Please take time to get to know my son, Jesus. When I feel insecure and insignificant, my initial reaction is to one up the other person in the conversation by stating what I’m doing better. That doesn’t accomplish anything though but make me look foolish and possibly hurt her self esteem. God popped this verse into my head as a reminder to be humble. 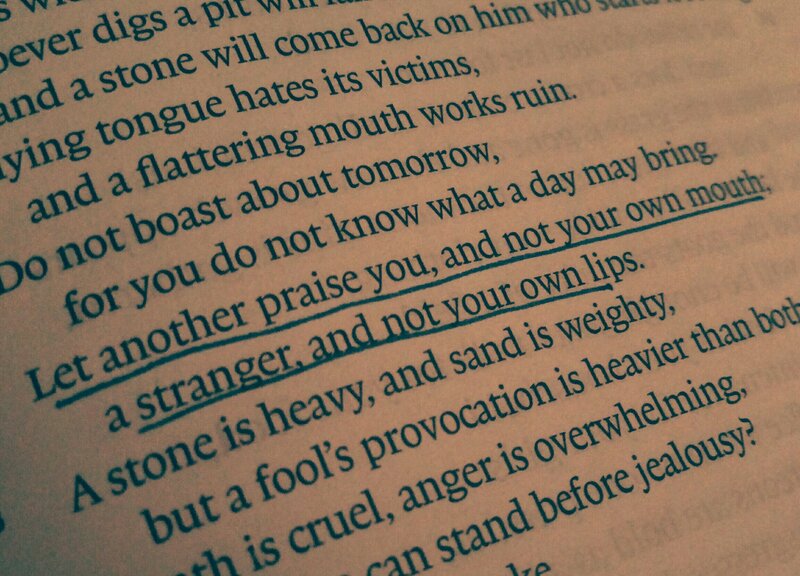 I don’t think this verse is saying to crave the praises of others but simply to refrain from praising myself. Really all the focus should be on God anyway. My goal and prayer for the coming weeks will be to remember this verse, strive to praise God with how I live, and criticize others less quickly. This is too good of a metaphor not to share even though I should be going to bed. I’ve heard the first part of this verse quoted by my Alma mater many times since it’s their motto, but maybe I’ve never read it in context. Some cool truths popped out at me tonight. God made the Earth with the intention of separating us into time periods and nations. The tower of Babel wasn’t God trying to discipline; it was part of the plan. That’s not even the metaphor I’m most excited to share. God separated the people so that we could seek him and feel our way to him. Feel for him? Seeking is usually done with the eyes. I seek for a friend in a crowd by looking, not feeling with my hands, but someone who can’t see with their eyes needs to feel. Therefore, God is saying here that we are blind. How are we blind? Both Paul and John refer to us being blinded by sin in 2 Corinthians 4:4 and John 12:39-40. Before knowing Christ, we can’t see. Only through Christ are the blinders removed. It just gets cooler though. Here we are, before believing, grasping at anything around us hoping it’s what we desire, even if we don’t know what we desire. We’re blind and can’t see past our own sin, but God is still right there! Verse 27 says he’s not far. He’s there waiting for just the right moment to reveal himself and remove the blinders, but in the meantime he’s still close by. He was there letting us feel his presence and protecting us before we even knew who he was. That’s some pretty cool stuff. Do you interpret this passage the same way, or do you see something different?